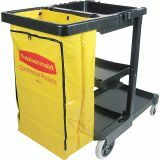 Rubbermaid Commercial Janitor Cart With Zipper Yellow Vinyl Bag - Janitor cart offers a smooth, easy-to-clean surface and innovative features to improve staff efficiency. Design includes three shelves for supplies; hooks and holders for mop handles, broom handles and lobby dustpan; paper towel holder; and zippered 25-gallon vinyl bag. Wire form holder keeps polyliner secure. 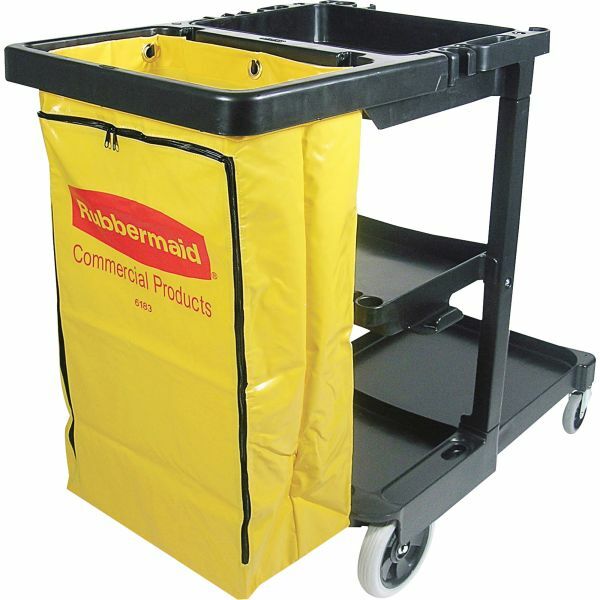 Platform holds 32-gallon container or standard-size buckets (not included). 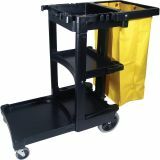 Janitor cart rolls on nonmarking 8 rear wheels and 4" nonmarking casters. Replacement vinyl bag is sold separately."